I have been following miniatures on Kickstarter for the better part of a year, and finally jumped in this week as a backer for the first time. Torn Armor is a fantasy skirmish game with some interesting variations on the familiar tropes. My daughter (and my frequent Song of Blades and Heroes opponent) was attracted to both the Greek inspired army and the almost-but-not-quite-cute animal faction. After a great opening day, the funding slowed, but it has had a strong run the past few days. 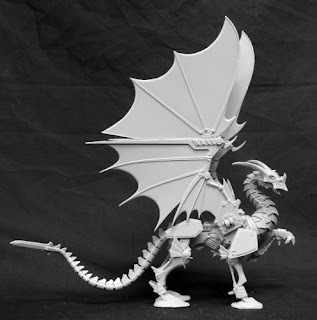 A big reason for the increased enthusiasm has been the announcement of an inclusion of Reaper's Clockwork Dragon for the first 500 backers at the game level, along with some other options that have been announced. I hope this funds, but if it doesn't, it will be increasingly clear that the Kickstarter game community wants to see more physical products before backing, no matter how great the idea - witness Rick Priestly's recent Gates of Antares project.